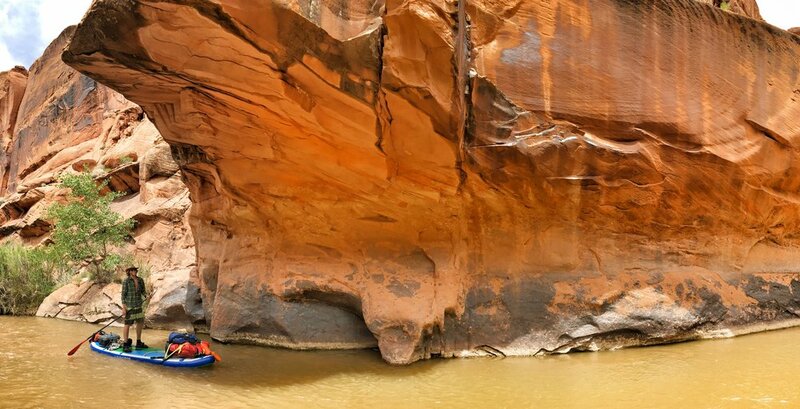 Last spring, I began asking around the river community if anyone had ever SUPed the Escalante River in Southern Utah. The answer I got wasn't much, a few pack rafters had done it over the years, but no SUPs had any beta on the 101-mile section. 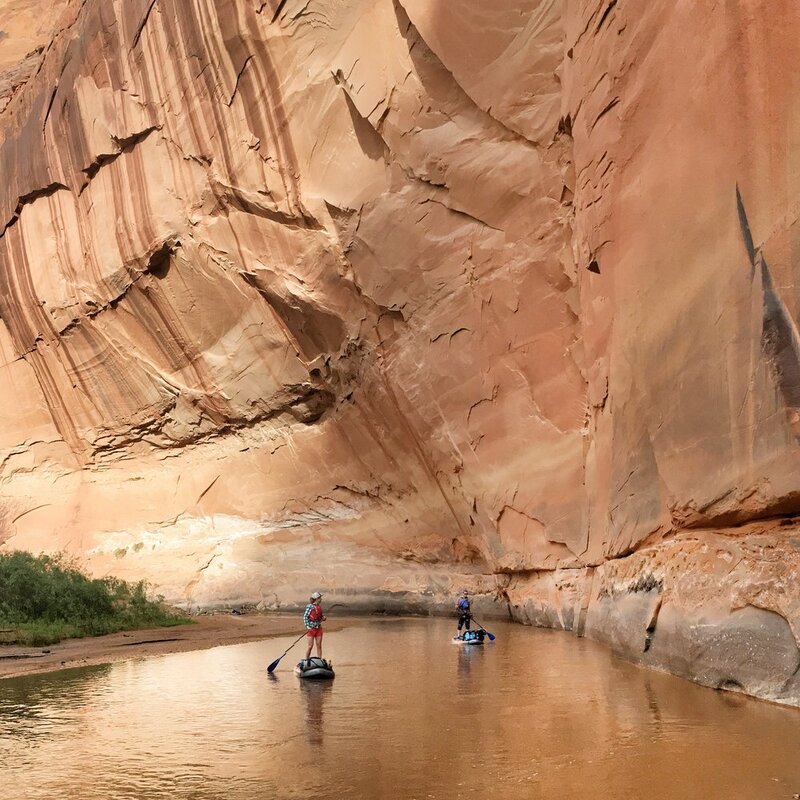 So with little information, and even less gear packed on the front our boards, we headed west to explore one of the most remote areas in the US by stand up paddleboard. Because this river is barely a trickle most of the year, there is a small window when peak runoff occurs and enables crafts to brook passage. And while we thought we timed the advent of our adventure perfectly, for the first ten miles the water was merely a drip certainly not a river. We dragged boards, loaded with all our gear over rocks, and laid down to make the meager passage beneath Russian Olive trees hanging nearly to the surface of what water there was. After two days of this slow struggle, covered in scratches and bruises, we were exhausted and questioning our decision. But after a few more turns beneath towering cliffs, and tributaries adding a few CFS we remembered why we had set out to explore this unknown stretch of water. The river banks were close in and the current meandered around horseshoe curves, in a landscape that was carved by the elements for over many millennia. The going wasn’t easy by any means, portaging rapids created by rocks the size of school buses that had fallen off the cliff face, and downed trees blocking the current, everything kept us on our toes. But the breathtaking scenery was impossible to curb our enthusiasm at what each new bend in the river would reveal. So we picked our way slowly, gaining around 20 miles a day. Other than a few mountain lion tracks, we saw little wildlife and even fewer humans. We camped on the side of the river, finding sandy shores were we could drag our boards out of the water. And collapsing in exhaustion, stayed awake just long enough to boil river water and make warm, freeze-dried meals. Using the little information we had, we looked for streams along the way to refill, winding up narrow slot canyons to find fresh water dripping from a crack in the rocks. A few days in the weather changed. After an overcast morning, the sky suddenly erupted sending pellets of hail down on us. As it got exponentially more intense by the second the river rose around us and we made the call to get off the water, and find shelter. A cave high on the canyon gave us a safe haven to watch as flash floods poured down the cliff walls around us. When the weather finally subsided we had additional flow on the river, but it was churned up and thick as chocolate milk. The further we traversed into the landscape the more it changed around us. The seemingly mile high cliffs finally gave way, and widened, leaving towers of ancient rock in the middle of turns. The last 5 miles was the most unknown, we were officially in Lake Powell but the water level is down over 100 feet and we had no idea what to expect in terms of miles to travel. On a SUP we were able to skim above the 2" of water above quick sand. The landscape, not long ago under water, was eerie and desolate. Coming around a final turn, we were confronted with the emerald waters of Lake Powell. We had successfully navigated 101 miles of twists and turns, and rapids and trees on nothing but a standup paddle board. We celebrated the only way that seemed appropriate- backflips into the clear lake and frolicking like water nymphs to think all we had passed through in just 7 days.